Американский производитель ESD, по ссылке дополнительная информация и прайс-лист EXWork. Для эффективной работы гидрогенератора, расход воды через турбину должен быть не менее 3 кубометров воды в минуту. для подвода воды через шланги. *Please note: Energy Systems and Design's pre-built machines carry a one year warranty; however they do not warranty individual components (such as Pelton wheels) that are used in non-ES&D machines. SHAFT ON TURBINE CAN BE CUSTOMIZED TO ANOTHER LENGTH. STANDARD LENGTH IS 18''. CUSTOM SHAFT REQUIRES CALL-IN TO RECEIVE A CUSTOM PRICE. Energy Systems and Design has been producing micro-hydroelectric components since 1980, and offers a wide array of products and services to the renewable energy (RE) marketplace. Now, ES&D offers the LH1000, low-head propeller turbine, and international installation services. The LH1000 employs a brushless, permanent magnet alternator which is adjustable, enabling the user to match turbine output to electrical load. It has a higher efficiency than previous alternators, and is capable of outputs over 1 kW, while requiring virtually no maintenance. ES&D’s microhydro systems employ high efficiency, precision-cast parts, and non-corrosive alloys for long life and durability. A digital multimeter accompanies each turbine for measuring output amperage. These units can be used in stand-alone, or grid-tied systems. The LH1000, like the Stream Engine, is designed to operate in conjunction with battery-based power systems, in order to store electrical power for use at times when consumption exceeds generation. Power is stored during periods of low demand. An inverter is used when residential AC power is desired. To gain enough head to operate the LH1000, water is channeled into a sluiceway. 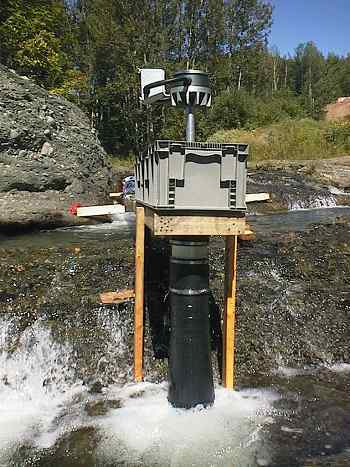 The turbine is mounted in a 18cm (7”) opening in the sluice bottom, with the draft tube extending to the tailwater below. The water turns the propeller, creating shaft power. This, in turn, powers the generator, producing electricity. The LH1000 typically operates at 12, 24, 48, or 120 volts. It can be specially wound to operate at 240 volts, when necessary. Employing the same adjustable, permanent magnet generator as the Stream Engine, the LH1000 has reconnectable wiring for use at a wide range of sites. To determine the power available at a site, head and flow measurements must be taken. Flow is the rate at which water moves, measured in liters per second (l/s) or gallons per minute (gpm). This can be measured by channeling the water into a pipeline, then into a container of a known volume, noting the time it takes to do so. 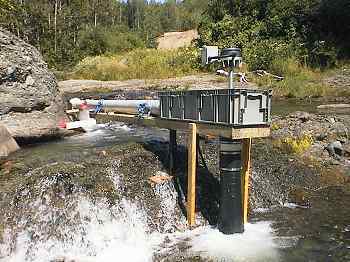 A weir can be used to measure flows in larger streams. Head can be measured by using a transit, by siting along a level, or by using a pressure gauge at the end of the pipeline. An altimeter can also be used, so long as it is accurate, and sufficiently sensitive. It is important to keep in mind that output can only be accurately determined if head and flow measurements are made correctly, so care should be taken during this process. Two other important factors in a site assessment are system voltage, and transmission distance. The voltage and distance the power must travel can affect the efficiency and cost of your transmission lines. The Energy Systems and Design permanent magnet alternator has been designed specifically for micro-hydroelectric applications. With an output of 500watts/1000rpm, it is over 80% efficient at full load. Operating without brushes, and with its windings encapsulated in epoxy, maintenance is minimal, and usually limited to bearing replacement. 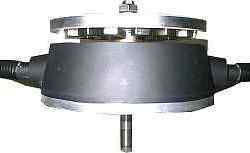 The rotor is adjustable so as to enable the user to vary the field strength, and match the output to the load. With a variety of wiring configurations, the permanent magnet alternator is ideal for most sites. It has a 17mm shaft and a 1.25mm thread pitch. Sealed ball bearings are used to give reliable performance and provide for easy procurement of spares. The Energy Systems and Design permanent magnet alternator is available in a series design (outputs up to 30 amps) and a parallel design (outputs up to 60 amps). A high voltage design is useful for long distance transmissions (120 or 240 volt), and can be used with ES & D transformer panels to step power down to battery voltages (contact us for details). Transformer panels are built inside an aluminum junction box, containing a transformer, a rectifier, wiring lugs for connecting the wiring to the loads, and a precision shunt for output amperage measurement, using the supplied digital multimeter. "Stand Alone" renewable energy system. Once your micro-hydropowersystem is up and running you will need a few more components to store and/or convert the electrical energy into a more useable form. Like PV arrays or wind generators, whether grid tied or stand alone, your new hydropower system will need what is known as "balance of system” components, including batteries, inverters, and charge controllers. Not to worry, we've got what you need! Batteries are an integral part of the self-sufficient energy system. Lead-acid, deep-cycle batteries are usually used in hydro systems. Deep-cycle batteries are designed to withstand repeated charge and discharge cycles typical in renewable energy systems. Ideally, lead-acid batteries should not be discharged more than about half their capacity. Alkaline batteries, such as nickeliron and nickel-cadmium, can withstand complete discharge with no ill effects. Check our battery selection HERE! A battery bank does not enable users to live with all of the conveniences of modern living, as most appliances use high voltage AC (alternating current), while batteries can supply only DC (direct current). Inverters are used to convert DC into AC so that stored battery power may be used, as needed, by appliances and other loads. Modern inverters are available in almost every size, from small, recreational to industrial types, and are designed for user friendliness, durability, and reliability. Look over our inverter selection HERE! When the load demand is less than the generator output, power is available to charge the batteries. When the batteries are charged to capacity, the power is diverted to a secondary, ”diversion” load, such as hot water heaters. The diversion of the generated power is accomplished by using a charge controller. Many types are available to perform this function. You can explore our charge controller selection HERE! Note: the manufacturer recommends the Trace C35 or C40. This item usually ships directly from the manufacturer in Canada. It will normally be shipped via Canadian Post which avoids import brokerage fees being charged to you. If you specifically request UPS 2nd Day Air or any other accelerated shipping methods, please be aware that UPS, FedEx, etc. will charge you an import brokerage fee after you receive the delivery. Typically this fee is $50-$60. If you want this item to be shipped by normal Canadian Post but for the rest of your items to be shipped via a faster method, please write this information in your order's notes during checkout.